"The project of conserving and restoring the Gate, the Screen and the Rockery at Phung Tien Palace has come to an end, but our collaboration continues,” stressed Sir Christian Berger, German Ambassador Extraordinary and Plenipotentiary in Vietnam. 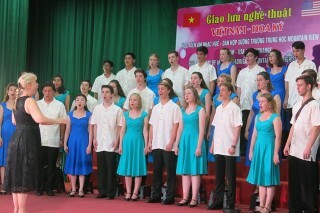 It also marks the successful foreign cooperation at the heritage of Hue. 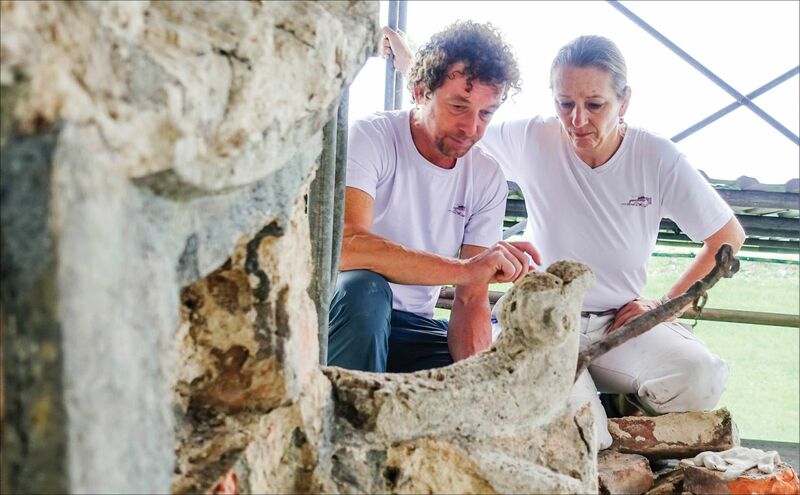 Andrea Teufel is one of the leading experts from Germany who participates in the restoration and conservation of the heritage of Hue. She has been with the ancient capital for 16 years and served as the leader of 5 successive projects. Before the project at Phung Tien Palace, she had worked on An Dinh Residence, Ta Vu (Can Chanh Palace), Toi Linh Tu (Interior Household Department), the Gate and the Screen at Tu Duc Mausoleum. The project of conservation and restoration of the Gate, the Screen and the Rockery at Phung Tien Palace in the Imperial City, combined with intensive training and led by the German expert Andrea Teufel was successful after more than one year of implementation. With the guidance and experience exchanges of Andrea Teufel, the Gate and the Screen at Phung Tien Palace have been fully conserved and restored with fresco (painting on wet mortar). This technique used to be employed on many constructions of the Nguyen Dynasty, but had been lost. Phung Tien is one of the five important palaces/temples of the Nguyen Dynasty, built in the 10th year of Minh Mang’s reign. This was the only place of worship that allowed women in the royal family to get involved in the rituals. For over 180 years of existence, Phung Tien Palace had been in repair many times before the war destroyed completely the main construction. The remaining supplemental parts such as the wall, the main gate, the screen, the rockery in the tank, etc. are also in serious ruin. Among the objectives of the project at Phung Tien Palace are to develop and apply new methods in conservation and restoration through the use of fresco, and to train in the process workers who master this traditional conservation technique. One of the strengths of Thua Thien-Hue in cultural heritage conservation is that the province has many good international cooperation relations, and Germany is the country that leaves a deep imprint on the heritage of Hue. In addition to the grants, Germany also sent many conservationists to support Thua Thien-Hue to implement the projects. They are experienced professionals in the field of hard materials, solid architecture, brick, stone and mortar. According to Dr. Phan Thanh Hai, Director of Hue Monuments Conservation Center, the important thing is that besides the restoration of important monuments, many high-quality human resources have been trained in the process. They are still young and have basic theoretical background, but still lack practical skills in advanced technology. Thanks to those projects, their workmanship got mature and they now become a crucial team in monument conservation. “We feel very proud that through the cooperation projects with Germany, the friendship relation between Vietnam, Germany and other international friends continues to be maintained and strengthened. 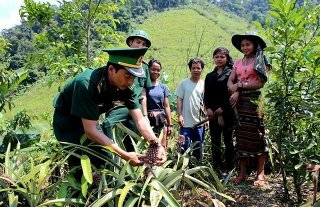 Many Germans now have a better understanding of the country, people and culture of Vietnam through the projects funded by the Federal Republic of Germany,” stressed Phan Thanh Hai. Very enthusiastic and friendly, Mr. Christian Berger, German Ambassador Extraordinary and Plenipotentiary to Vietnam came to Hue to attend the groundbreaking and completion ceremonies of the project at Phung Tien Palace. 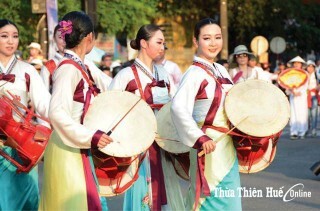 Every time he came to Hue, he expressed his love for the ancient capital. To him, Hue is small, beautiful and very impressive with unique cultural and historical relics which cannot be found anywhere in the world. He was happy to be able to contribute his part to the conservation of that precious heritage. 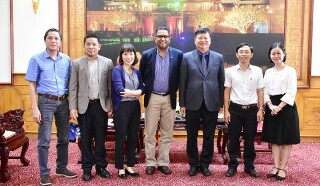 Furthermore, the ambassador was also very pleased to find Hue people often participate in debates with the authorities about how to preserve the cultural heritage of the city. 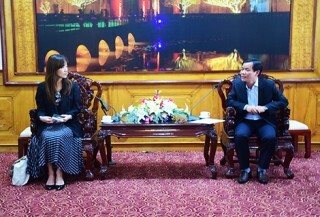 He hoped that, not only discussing, Hue people would involve themselves more directly in the conservation of the cultural heritage; at least they can take part in protecting the environment of the city and at the relic sites. Although no specific project has been mentioned, the German Ambassador Extraordinary and Plenipotentiary to Vietnam promised another project for Hue during his remaining time of his term in Vietnam. With his love for Hue, he said he would for sure come back to visit and recommend this beautiful city to his friends even after he finishes his office term.